Spend a full week in Georgia with our 7 days’ tour and learn all about this Caucasus country. The Georgia tour below includes excursion of its capital – Tbilisi, the Eastern region – Kakheti, tour to Kazbegi (also known as Stepantsminda) and a special drive in 4-wheel-drive car to one of the most picturesque places in Georgia – Gergeti Trinity Church. 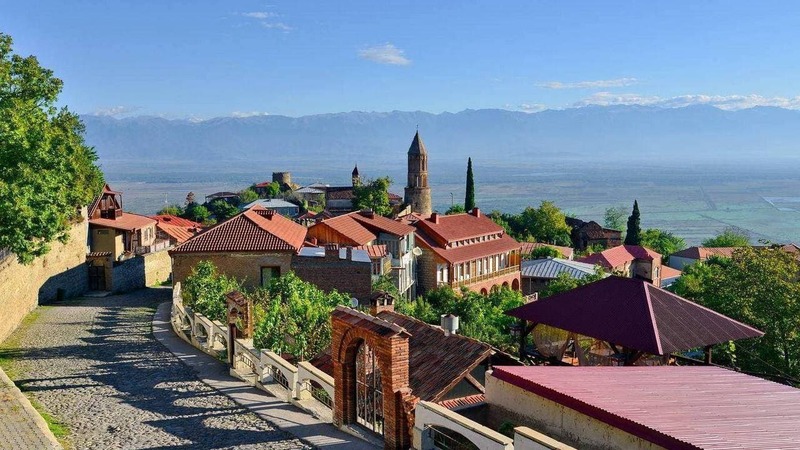 Visit country’s old capital town called Mtskheta and enjoy traditional Georgian wine in Kakheti. Also, as part of this private tour to Georgia, you will be able to spend a day on your own in Tbilisi wondering around, doing shopping, or visiting places our Company suggest, and enjoy this wonderful city. Tour to Georgia would not be complete without a journey to Kazbegi, a small town close to the border with Russia. The tour itinerary for this day will start with the Jvari monastery, architectural gem of the Caucasus, located on top of the hill overlooking major Georgian highlights – its old capital town Mtskheta; famous two rivers merging point where Mtkvari river meets river Aragvi; and transport highway entering Tbilisi. Another site worth making a stop on the way is Ananuri fortress – established in XVI century as a residence for local Dukes of Aragvi the complex is still a place that impresses all those passing by with its nobility and greatness. Other attractions en route include exciting view of two small mountain rivers making one, and flowing side by side without mixing their colors for quite a distance; also a picturesque mountain landscape viewpoint followed by the “Cross” pass. Arrive in Kazbegi, change a vehicle for 4-wheel-drive cars to get to Gergeti Holy Trinity church, nestled on top of one of the highest hills at 2170 meters above sea level. Drive to local hotel for dinner and overnight. You can also choose one of our day tours in Georgia itineraries, which are not covered by this tour. Tbilisi (5 nights) IOTA Hotel, Mercure Hotel, Ambassadori Hotel, Rooms Tbilisi Hotel, Riverside Hotel, etc. Tiflis Hotel, Betsy’s hotel, Old Kopala Hotel, Urban Boutique Hotel, etc.